Christmas is the most magical time of the year! There are so many reasons to love this season. I love the lights we see everywhere at Christmas time. The lights reminds us of Jesus Christ, who is the light and life of the world. I’d love to give you a few ideas to Light the World this Christmas, including making a simple soup you can serve to those around you! Over 2000 years ago, the most significant birth in the history of the world took place! The birth of our Savior, Jesus Christ. He is the light and life of the world and we celebrate His birth every year at Christmas. The life of Christ is recorded in writings and is found in the Bible and in the Book of Mormon, another testament of Jesus Christ. His ministry, teachings and love, are all recorded for us to learn how to be more like Him. Looking back, the most meaningful experiences we have had as a family at Christmas were the years we focused on serving. Are you wondering how you can make a difference? And how you can make Christmas different this year? I love this advent calendar from The Church of Jesus Christ of Latter Day Saints. The calendar suggests “In 25 ways, over 25 days” simple acts of service to help you and your family follow the example of Christ and share His light in the month of December! Because I love everything about food, I especially love December 7, a day designated to feed the hungry. “Jesus fed the hungry and so can you”. 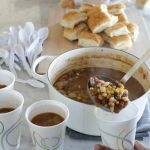 For years, I have tossed around the idea of making a batch of chili, and taking it downtown to share with our brothers and sisters in need. I’ve shared meals by simply dropping off food I have purchased in the past, but never quite in the way I envisioned. At the end of this post, I explain in detail how we carried out this simple service. If you have a project in mind, but have never put it into action, December is the perfect time to reach out to those in need! Volunteer at a homeless shelter or soup kitchen. We have done this several times at one of our local shelters, The Road Home. Look for opportunities to donate and serve in a shelter in your area. There are so many ways to serve! At The Road Home groups can bring in meals ready to serve and sack lunches can be donated to preschool age children who are in the shelter during the day. Invite a neighbor over who may be struggling financially and share a meal. Often times we forget about senior citizens on fixed incomes who would welcome some company and a meal. Organize a food drive, collect and donate food to your local food bank. This can be on a small scale, amongst family, friends and neighbors. Assemble pantry packs for school children to use on weekends. This is a great project for youth groups. If this program is not in place in your community, send me an email and I’ll connect you with someone who can give you more information. Many school children receive financial aid toward breakfast and lunch while they are at school during the day, but have limited access to food while they are at home on the weekends. This program provides children who are in need pre-packaged meals for the weekends. 1:00 pm – Trip to grocery to purchase ingredients for Sharing Soup: 50 12-16 oz cups with tight fitting lids, 50 rolls, sandwich bags, plastic spoons, lunch sacks, 50 water bottles. It is helpful to have bins or cardboard boxes to place lunch sacks in after filling with soup cups. A container with sides is best so the sacks won’t tip over while transporting. 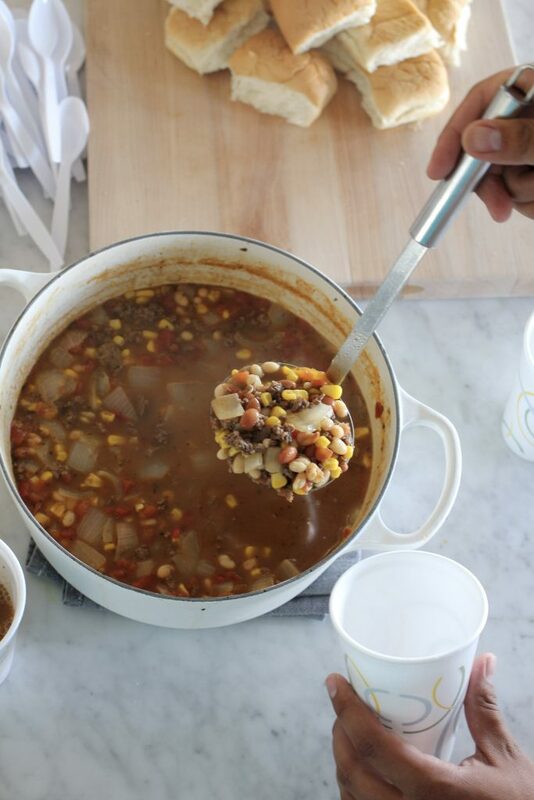 1:45 – Make 3 batches of soup – this process will be quick if you have help! 2:30 – Let soup simmer, bag rolls individually into sandwich size ziplock, place in lunch sacks. 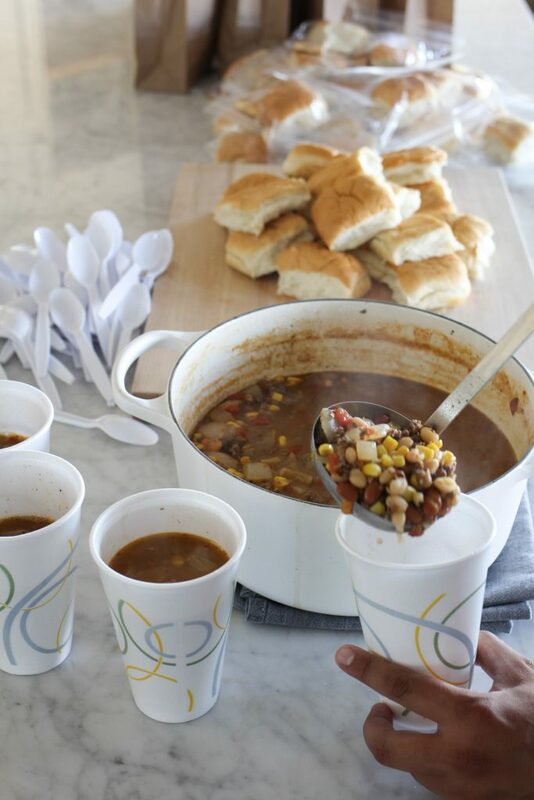 3:00 – Scoop hot soup into cups, place lids on cups. Place soup cups into sacks with roll. Place spoon in each sack. 3:30 – Place filled sacks in car along with water bottles. If you are setting up in one place and handing out food, a folding table may be helpful. 4:00 – Arrived at park. We decided walking through a park where many of the homeless gather would be the best option for our group. 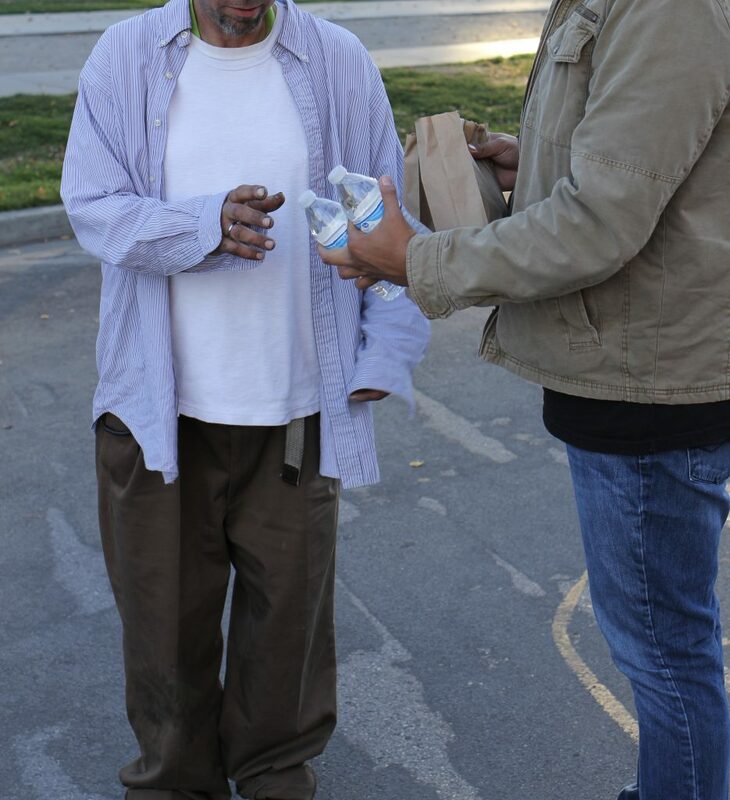 We took bins of pre-filled sacks and distributed soup and water to those in need. We carried the water separately from the soup to keep the soup from spilling in the sack. We made a couple of trips back and forth to the car, so we weren’t trying to carry all of the sacks at one time. I hope this post will inspire you to look for ways to serve, and in particular, feed the hungry this Christmas. There is no greater gift we can give to the Savior than to share His light and love. Each small act of kindness will help light the world! Brown the ground turkey or ground beef in a large stockpot with chopped onion over medium high heat. Season with salt and pepper. Drain any fat if using ground beef. Add oregano leaves, cumin and 2 cloves chopped garlic. Sauté for about 2-3 minutes over medium heat. Add all canned ingredients. Do not drain cans. Add chicken broth, bring to boil and simmer for about 10 minutes. Add corn and cook for another 5 minutes or until mixture is hot. -The recipe as written will serve about 8-10 served in soup bowls, or 15- 8 oz servings. -If you are making this soup for 50, increase the amount of beans to 4 cans per recipe, and 3x times the recipe. You will have about 50 generous one cup servings. -Purchasing a Styrofoam cup with a 12-16 oz capacity is best to keep the soup from spilling. Make sure the lids you purchase fit tightly as well. The cups in the photographs are Kroger brand cups and lids. They were 16 oz cups, and the cups were filled a little over 1/2 full. -If the cups are filled when the soup is hot, the Styrofoam will keep the soup warm for a long period of time. You are a light. What a great idea, thanks for sharing the details of how easy it was. Melanie, Thank you! Next time, we need to do this together! Si, thank you for being the kind of person and friend I can always admire and learn from. You are truly a genuinely generous person. This is a beautiful example of how to serve our brothers and sisters. Thank you for this post !! Thank you for being a light in so many of our lives.